After the long day yesterday, we got up a bit late. It was still hovering around zero, and was cold and mostly overcast, but there were spots where it cleared up for us. On the drive back from the Arctic Circle we had missed the main lookout over Tombstone Mountain due to darkness, and I wanted to go back and take some pictures. I was hoping the light would be better, and was also hoping that maybe we'd see some more critters, which didn't really happen. We got ourselves organized, so that we could pretty much hook up and leave, then went out for a short drive to take some more pictures. A better picture in the morning light showing how dirty the truck was. You couldn't even see light in the headlights. The drive was pretty nice. There were still a lot of clouds, but the snow was gone, and the clouds had lifted fairly high. You could start to see what the scenery would have looked like yesterday, if we could have seen it. Sadly, at the look out, Tombstone Mountain itself was mostly hidden in the clouds. But you still got this view. 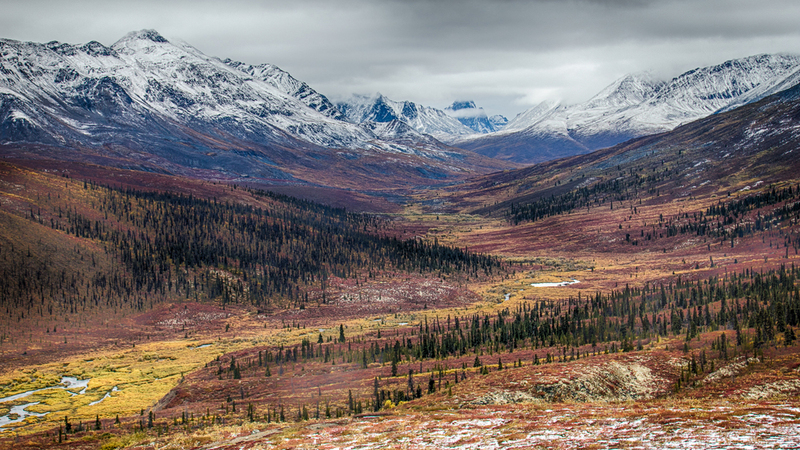 The amazing view from the Tombstone Mountain viewpoint. You can sort of see the mountain right in the middle, in the clouds. A zoomed in close up of the mountains. I was secretly hoping we might be able to drive all the way back to Two Moose Lake, but I spent quite a bit of time taking pictures, and we were eager to get going. So we turned around a fair bit short of there. There were so many great views even just along this short stretch that we drove that morning. The little lakes dotting the landscape are beautiful. I think we're a little late for birds, but I imagine a few weeks earlier there would be a ton of them. A small stream cuts through the landscape. 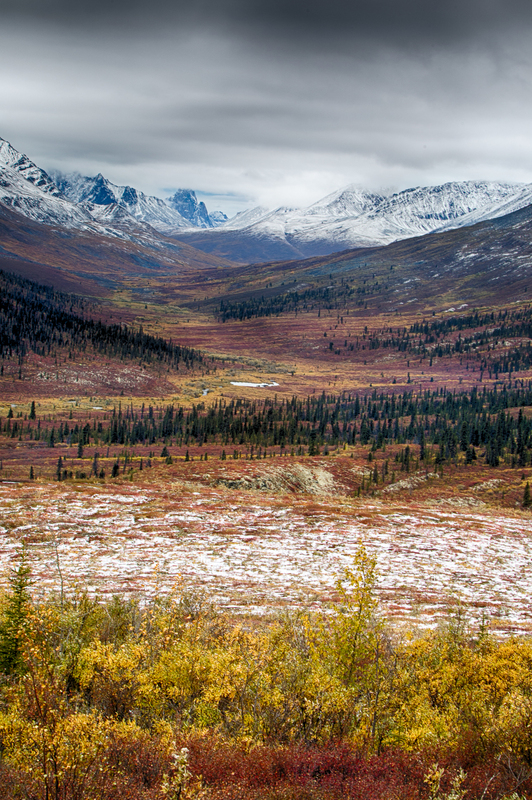 The Dempster cuts through the fall colours on the tundra, seemingly going on forever. The only critters we saw that morning were ptarmigan, starting to change their colours. We left the campground and started back towards the start of the Dempster. I definitely plan to come back and explore this area some more. I could easily have spent a week or more just exploring Tombstone and the surrounding area. I would have been happy to wait for the weather to clear, to get some of these shots with a bright blue sky. Alas, that was not to be. 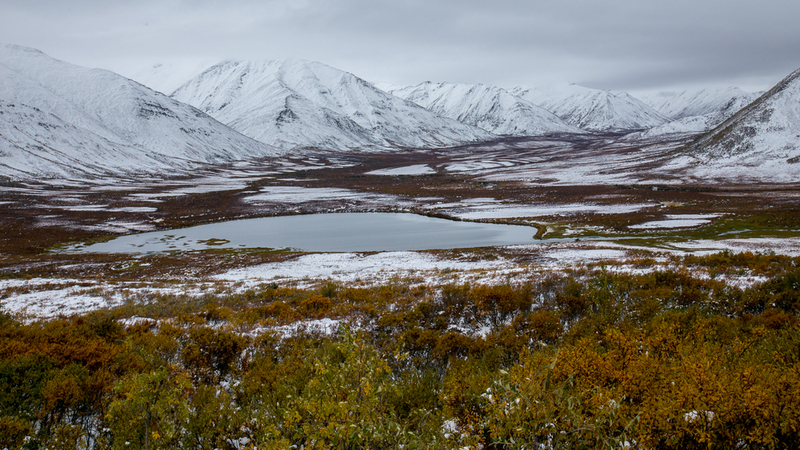 Saying goodbye to Tombstone Park and the Dempster Highway. We were suddenly seeing a lot more mountains on the drive out. Sunshine! It just pops the colours. Crossing the river at the start of the Dempster Highway. We were back onto pavement at this point, and on our way south. Mining cart on our stop at Stewart Crossing. The drive was pretty uneventful, but beautiful. The sun came out finally, and the colour on the mountains was amazing. We drove for a couple of hours, stopping for lunch at Stewart Crossing. The drive continued to be pretty uneventful. We made a short stop at Five Finger Rapids for a great view over the Yukon River. We didn't do the walk down to the river, but maybe should have. Five Finger Rapids from the viewpoint. The riverside boardwalk in Carmacks. From there, it was a short drive into Carmacks. We were staying at the Carmacks Hotel and RV Park - not the nicest place we've stayed but it was just for the night. The benefit was that it was right on the river. After we had got all organized, it gave me a chance to do some fishing. It was mostly uneventful, but I did have one decent sized fish that I got as far as shore before it jumped the hook. I'm not sure what it was but I think it was some type of salmon. They've built a boardwalk along the river so we did the short walk before dinner. There were a ton of trees takes down by beavers, although it's unclear where they would be taking them. A view from the river, just out front of our campground. We had a great dinner and had Dave and Linda over for dessert, as it was our last night together. It made for a fun evening. We were off early the next morning on our way south. I "waterlogued" one of my Tombstone pictures, as this is how I remember Tombstone.